Update: The American Companion is out -- anecdotally available for some time at bookstores, and released March 9th, according to Amazon. The whole thing seems to be swimming in imprecision. 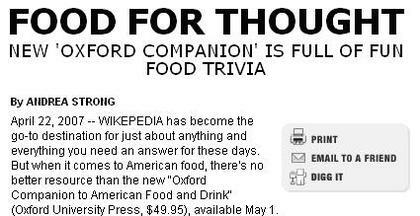 Those dons at OUP are adding an American companion to the Oxford Companions to food and wine. This expansion of the franchise is a logical extension of the Oxford Companion brand, but if I ran the zoo, I might focus on making sure the extant companions had their ducks in a row. As detailed here recently, the entry for guanciale is plain wrong in the original 1999 edition, and the 2002 Penguin edition, and reader Aeneas chimed in later to report that the 2006 revised edition repeats the error. In the grand scheme of things, it's hard to imagine "you don't know your belly from your jowls" becoming the new expression of ignorance, but other readers, notably Max wrote in to suggest that Davidson's original opus is an impressive individual accomplishment, but not a reliable reference. I have zero experience running giant popular/academic presses that have been printing books for centuries, but I'd suggest that a reputation for accuracy is pretty important for the reference wing of the business, and that privileging fact checking over aquisitions for a while might be a good idea. Of course, in a world where a major New York daily misspells "wikipedia" in a lede, perhaps precision in reference works is a forlorn hope. Andrea Strong is a scourge in any form. The article is possibly not the most rigorous review of a food reference imaginible, but the Wikepedia thing is on the Post, not Strong. True dat, and good for you for keeping it all fair. And let me know when you decide to tackle the wonder that is "Strong Buzz," b/c I have a lot to say on the subject, obvs.